A proposal by the NRA in response to calls for increased gun control has sparked a public conversation. 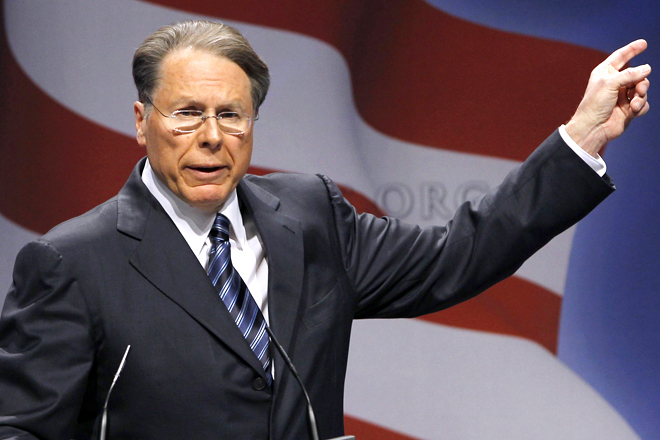 The post-Sandy Hook statement by NRA Executive Vice President Wayne LaPierre called for the provision of armed guards in every American school. A public debate has ensued over the response to the tragedy. However, a small line about financing the plan has garnered little attention. “With all the foreign aid, with all the money in the federal budget, we can't afford to put a police officer in every school?" asked LaPierre in his prepared remarks. "Even if they did that, politicians have no business — and no authority — denying us the right, the ability, or the moral imperative to protect ourselves and our loved ones from harm." His rhetorical question makes two political points. The first questions the spending on foreign aid and the second makes an argument that the federal budget is bloated and filled with waste. The two together act to say that foreign aid is an example of wasteful spending by the US government. Putting an armed guard in American schools would be a costly endeavor. There are 98,817 public schools across the United States. An armed guard at each school who commands the average American salary of $43,000 will cost $4.24 billion. Police officers make an average of $55,000 a year which would mean that the cost could be even higher. Adding in other administrative and implementation costs could take the program to somewhere near $4.5 billion. When it comes to funding new programs or making budget cuts, foreign aid is near given in the discussion. Senator Rand Paul unsuccessfully tried to block US aid to Egypt, Pakistan and Libya in October and responded by launching an attack advertising campaign. A budget passed by the House of Representatives in the midst of the 2011 debt ceiling standoff included a $6.4 billion cut into the State Department budget. Supporters of US foreign defend cuts on a few fronts. First, they say that the budget is already small. US foreign aid represents under 1% of the entire federal budget. Making cuts into foreign aid will not make much of a dent into budgetary problems or the national debt. Second, aid is a tool of US foreign policy. It engenders better relations with countries and supports American interests around the world. Third, when money is distributed effectively aid can save lives. Aid works best not when it aims to achieve such sweeping goals as democratization or economic growth, but when it’s channeled into things that can actually yield tangible results," wrote Charles Kenny of the Center for Global Development in a Businessweek article that analyzed the stances of the 2012 Presidential candidates. "In fact, foreign aid has helped save millions of lives, been instrumental in getting millions of kids into school, and helped build water and sewage lines, roads, and electricity networks." Kenny argues that aid has not worked in terms of promoting better governance by citing research by NYU's Bill Easterly. However, there have been many major gains that can be attributed to foreign aid spending including the reduction in deaths caused by malaria, the slowing spread of HIV and the reduction in deaths by children under five years old. India passed one year without polio in 2012 as the disease is nearing complete eradication. Guinea worm will disappear from the planet as well thanks to a concerted effort by former President Jimmy Carter's foundation. Only two diseases, smallpox and rinderpast, have been eradicated ever. 3.6 million people were affected by guinea worm in 1986, the point when the Carter Center began its work to eradicate the parasite. There were only a few hundred cases in 2012. The eradication of guinea worm is expected to be accomplished this year and is in some supported by the funding through the United States Agency for International Development (USAID). USAID Administrator Raj Shah explained the direct cost of cutting the foreign aid budget during the debt ceiling debate in 2011 saying, "We estimate, and I believe these are very conservative estimates, that H.R. 1 (the proposed legislation) would lead to 70,000 kids dying." The United States provided $30 billion in aid during 2010. Moving $4.5 billion from the foreign aid budget to fund the NRA proposal would result in a roughly 15% cut into a part of the budget and exact a similar toll to that estimated by Admin Shah in 2011. A recent OpEd from the Seattle Times made the argument for keeping foreign aid off the table for potential cuts related to the fiscal cliff negotiations. Over the past decade, 4 million people have been treated for HIV; 50 million for malaria. Millions more have received family-planning help to prevent unintended pregnancies. Baby deliveries are safer, too. But health advocates describe these advancements as extremely “fragile,”" wrote the editors.